Security forces had to deal with stone pelting youths after a combing operation in South Kashmir. (File Photo | PTI) Image used for representational purpose only. SRINAGAR: Four days after the Army Chief General Bipin Rawat warned protestors in Kashmir against obstructing anti-militancy operations, security forces had to deal with stone pelting youths after a combing operation in South Kashmir and accordingly security agencies have decided to strictly enforce tough restrictions near encounter sites. 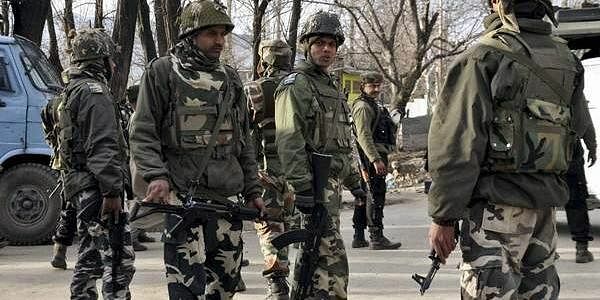 Police, paramilitary CRPF and Army’s 55 Rashtriya Rifles launched a joint search operation at Urvan village in South Kashmir’s Pulwama district yesterday. “After conducting searches in the village, the operation was called off. However, while the security personnel were leaving the place, a mob resorted to stone pelting,” defence spokesman in Srinagar Colonel Rajesh Kalia said. Police had to fire tear smoke shells and resort to baton charge to disperse the stone pelting youths. The clashes continued for some time. A police spokesman said legal action has been taken against stone pelters, who had every intention to disrupt the operation. Earlier, on February 15, the Army chief had warned that people creating hurdles during anti-militancy operations and displaying flags of Pakistan and ISIS in J&K will be dealt as anti-nationals and face harsh actions. The security agencies are worried over clashes and stone pelting near the encounter sites by people. An army official pleading anonymity said protests and stone pelting near encounter sites hamper counter militancy operations. “People are engaging security personnel in clashes to give militants an opportunity to escape from the security cordon,” he said. The official said keeping in view yesterday’s incident in South Kashmir, where mob pelted stones on security men after an anti-militancy operation, it has been decided that the advisory issued by the State government will be strictly enforced. He said the security men would take every possible measure including enforcing tough restrictions in 3-km radius near the encounter sites to prevent people from marching towards the encounter sites and engaging troops in clashes. “The advisory was already there but now we will be enforcing it strictly,” the official said. The state government recently issued the advisory and asked people not to move towards or assemble near the encounter sites to avoid loss and injuries to precious human lives. The prohibitory restrictions would be imposed within the radius of three kilometers from the site of any counter-insurgency operation. According to a police official, the government advisory would be strictly enforced for the safety of people. “During the encounter, you don’t know from which direction a bullet is going to come. If people make it to the encounter sites, then there is every likelihood that there may be civilian casualties. To avoid collateral damage, we would be forcing restrictions,” he said. The official said a contingent of police and paramilitary personnel during an encounter would be specially tasked to take care of the local population. “They would be making regular announcements from public address system to caution people to stay indoors and not to venture out for their own safety. The security men would enforce restrictions to prevent people from taking to roads and engaging security personnel in clashes,” he said. IG CRPF Operations, Zulfqar Hassan told Express that additional measures have been taken to prevent people from reaching the encounter site and pelting stones on security men.